I'm sure that everyone was, like me, shocked and horrifed by events in Boston this past week. With all its Irish connections, those of us who have family members there and the fact that thousands of students like me passed through, visited and lived there during our summer holidays in our college days, Boston has a special place in many Irish hearts including my own. The Vancouver Modern Quilt Guild is coordinating a fantastic project - a collaborative effort of makers to bring peace and love from far and wide. They are planning a public exhibition of flags strung into banners to be displayed in Boston - hopefully in early June 2013. I've seen pictures of flags springing up on Instagram in the last couple of days as other Modern Quilt Guilds and quilters around the world have started to participate and would love if our Irish guild could participate too. 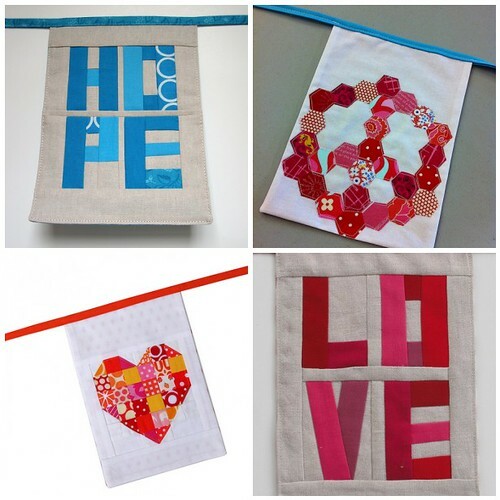 I (Sarah) will coordinate the collection and postage of flags, if you will make them and send them to me. The guidelines for making them are here - you can use the tutorials provided, or make your own design within the guidelines so I would love if you would get sewing and get your flag in the post to me to reach me by 13th May next, as they need to get to Boston before May 31st and I want to allow ample posting time. I will ask for a very small contribution (approx a euro/pound each depending on the total cost) towards postage also. If you are not a signed up member (why not? join us please! ), you can still contribute a flag if you want, I will accept flags from any Irish based quilter/sewist who would like to participate. So please comment below, or email me at mqgireland@gmail.com to participate and I will send you back my address and answer any questions you have.